Trabala vishnou — “Rose myrtle lappet moth” | Welcome, visitor! Trabala vishnou, the Rose myrtle lappet moth, is a common species found in South/East Asia, including India, Thailand, Sri Lanka, Myanmar, Java, China, Japan, Hong Kong, and Indonesia. 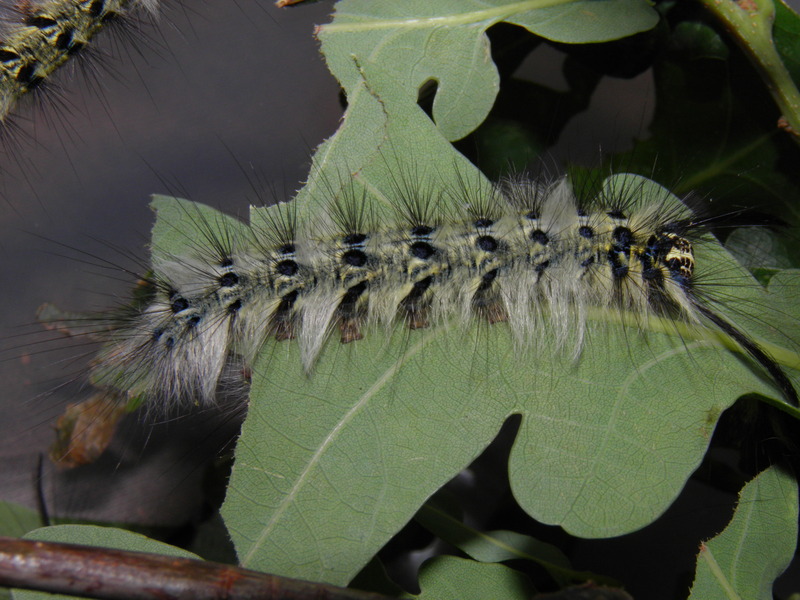 This species is more of a generalist that can be found in a multitude of habitats; the caterpillars are very polyphagous and have hundreds of confirmed food plants. Because of this they are able to survive in urbanised or agricultural areas, where they even have the advantage over other (more specialistic) species and can become relatively common, thriving on food crops such as tea plant (Camellia sinensis), guava (Psidium guajava), coffee (Coffea sp. ), and many other types of food crops. Because of this habit it is often considered to be a pest species. In reality Trabala vishnou does not exclusively attack food crops as the larvae are highly polyphagous, but they can survive on what is commonly available; in monocultures such as plantations or parks they will simply decide to feed on the fruit trees or decorative plants because that is the only option for them in such urbanised habitats. In the wild they feed on plants and shrubbery such as oak (Quercus sp. ), Eucalyptus, Geranium, java plum (Syzygium cumini), many types of roses and cherries (Rosaceae), Verbascum, crepe myrtle (Lagerstroemia) and many more. Trabala vishnou has a wide distribution and is found in both temperate and tropical climates. Multiple subspecies have been described. The subspecies found in the tropical regions of Asia are possibly continously brooded, reproducing themselves in two to four generations a year that are mainly dictated by the development time of the larvae (a few months) which are in turn dictated by the local climate (lower temperatures slow down development, causing the moth to have less generations in colder habitats) and environment (food plant quality and availability, etc). In the more temperate regions (China, Japan, Taiwan) however, this species seems capable of overwintering; it has been reported that the subspecies associated with temperate / palearctic climates overwinter in the egg stage. 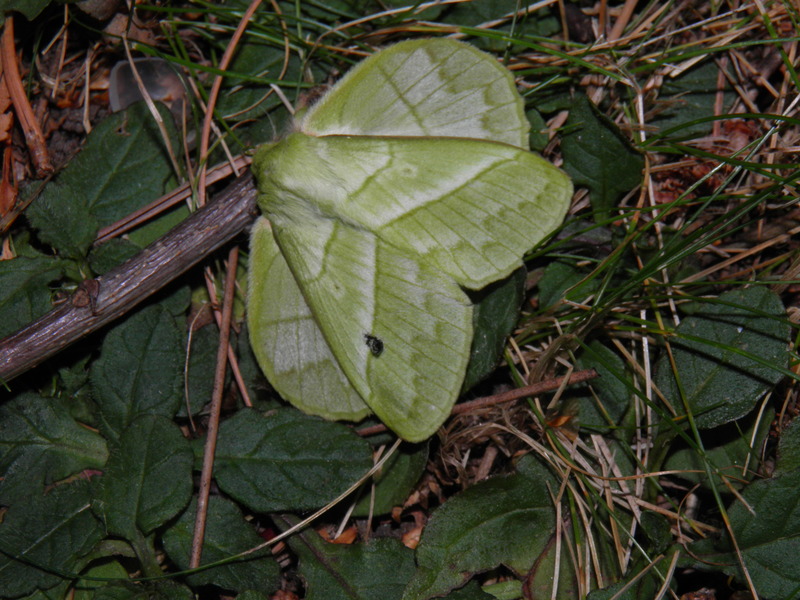 The adults of Trabala vishnou are very dimorphic and have an extremely leaf-like appearance. 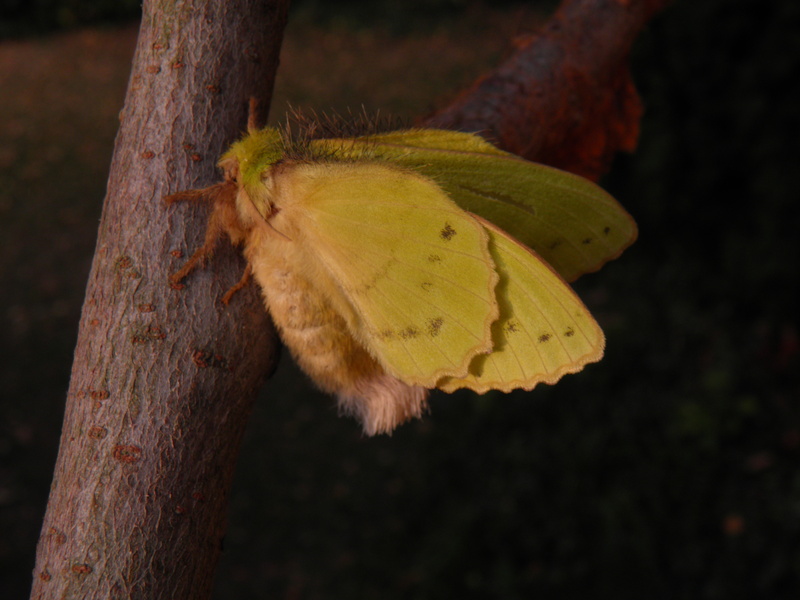 The males, which are small compared to the females, are bright green: when freshly hatched, they can be almost lime-green, although the intensity of their colour varies a little. Interestingly, their colour also fades with time as the green pigment seems to break down easily; some individuals tend to fade and become white/yellow or brownish. This can be observed in old museum specimens but also in live moths (although less dramatic); older moths tend to be more pale. 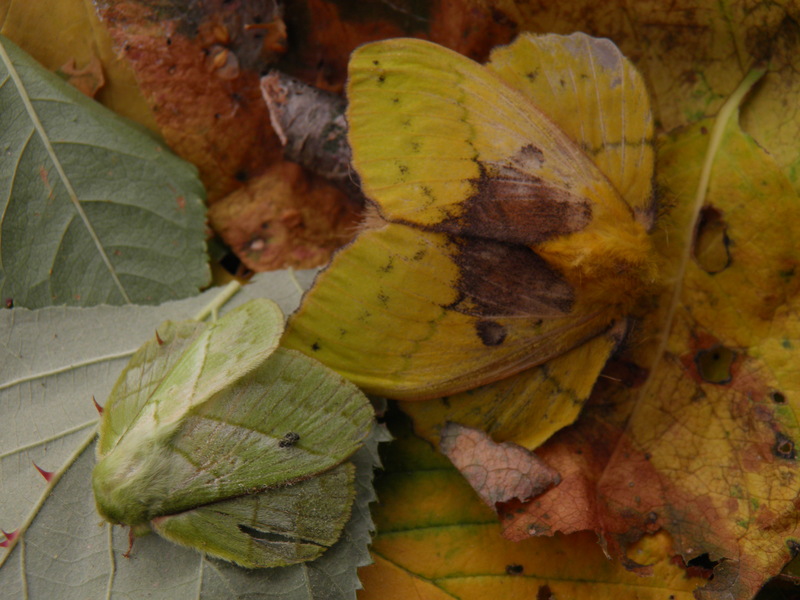 The females are much bigger than the males and are bright yellow most of the time; most of the time because females have a varying degree of green pigmentation. 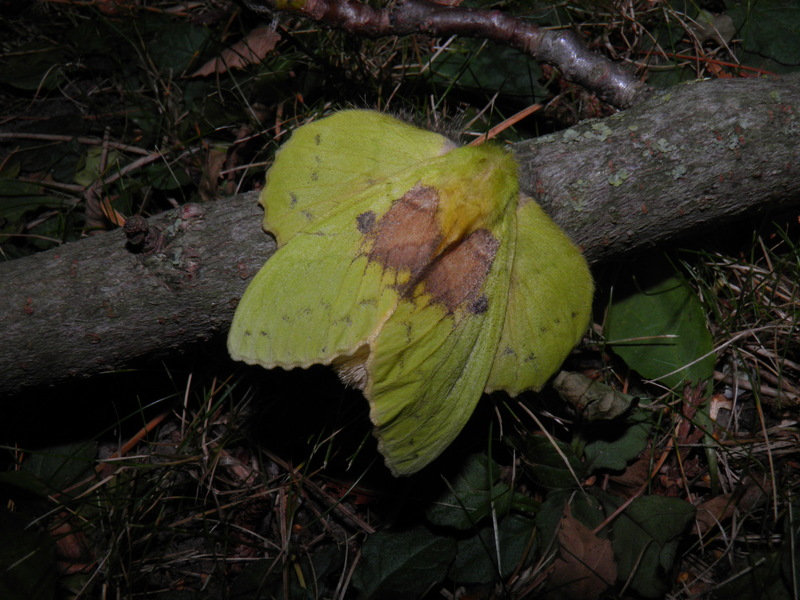 While most forms are yellow, in some cases females can be green/yellow or nearly as green as the males, but that is generally more rare. 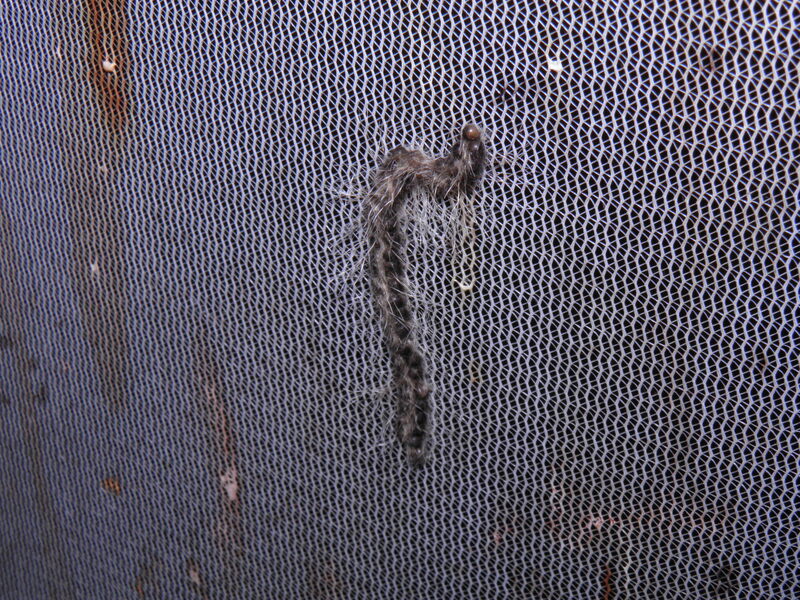 The females have a fluffly abdomen; they use the hairs to cover and protect their eggs. 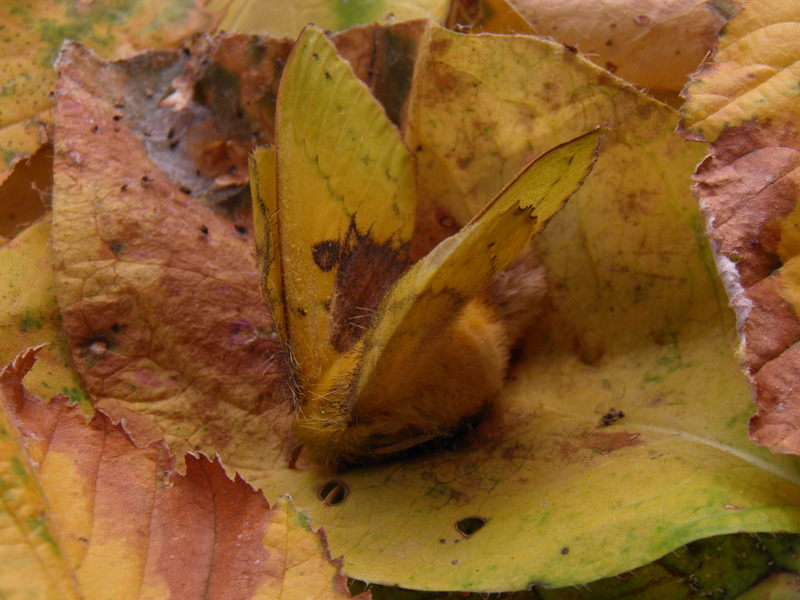 The moths are short lived and cannot feed: they die after finding a partner, pairing, laying about 50 to 200 eggs and dieing. T. vishnou appears to be nocturnal. Host plants: Eucalyptus, Quercus, Rubus(bramble), Rosa (rose), Camellia sinensis (tea), Coffea (coffee), Albizia, Liquidambar, Berberis asiatica, Castor bean (Ricinus communis), Geranium, Java plum (Syzygium cumini), Eugenia, Lantana, crepe myrtle (Lagerstroemia), Guava (Psidium guava), Great mullein (Verbascum thapsus), Indian almond (Terminalia catappa), Sapodilla (Manilkara zapota) many types of Rosaceae, fruit trees (Punica, Prunus) and shrubbery. In captivity, Trabala vishnou is an easy species to breed and study, even for beginners. 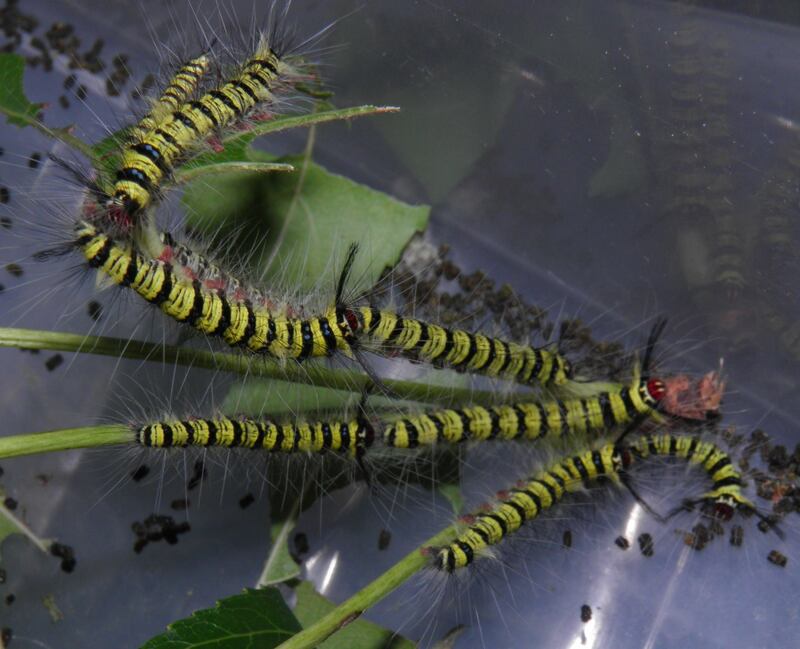 The caterpillars are very tolerant and will feed on a wide variety of food plants and are perfectly fine on room temperature, although they appreciate warmer temperatures. They are even very tolerant in regards to ventilation. It is best to raise them in well ventilated containers, sleeves or cages made of netting to enable airflow; however if raised in closed, airtight plastic boxes they can still be raised to adulthood if kept reasonably clean – in these conditions, most other Lasiocampidae would perish from infections and excess humidity. 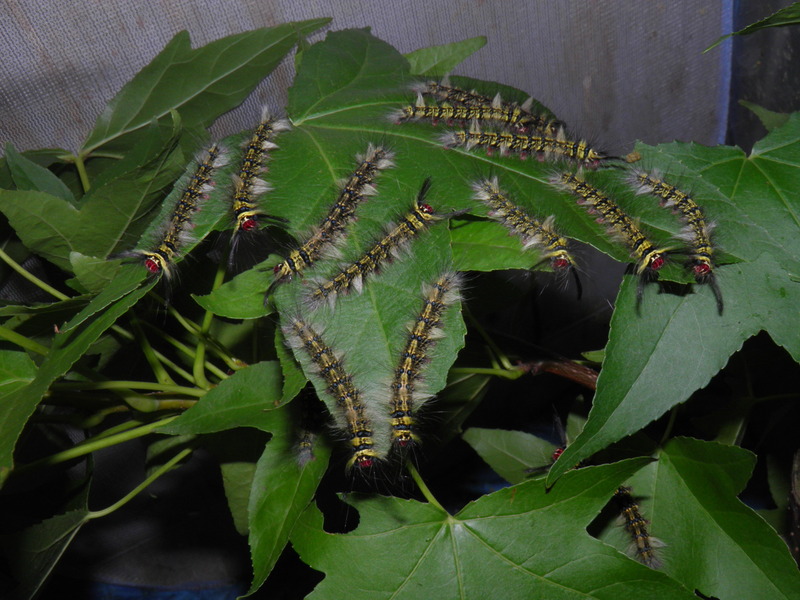 From my personal experience, the best food plant to raise them on was sweetgum (Liquidambar) – they thrived and grew quite large on this plant; although due to their extreme degree of polyphagy and the fact they naturally feed on many food plants completely unavailable in Europe, I am and will never be able to evaluate all of the food plant options. However, I have also raised them on oak (Quercus) and eucalyptus (Eucalyptus gunnii) with reasonable success, although they grew notacibly slower on Eucalyptus than any other food plant – but the mortality was still very low. Others report succes on bramble and raspberry (Rubus sp. ), various kinds of cherry (Prunus sp.) and rose (Rosa sp.). In the wild they really seem to like tea plant (Camellia sinensis), guava (Psidium guajava), coffee (Coffea sp.) 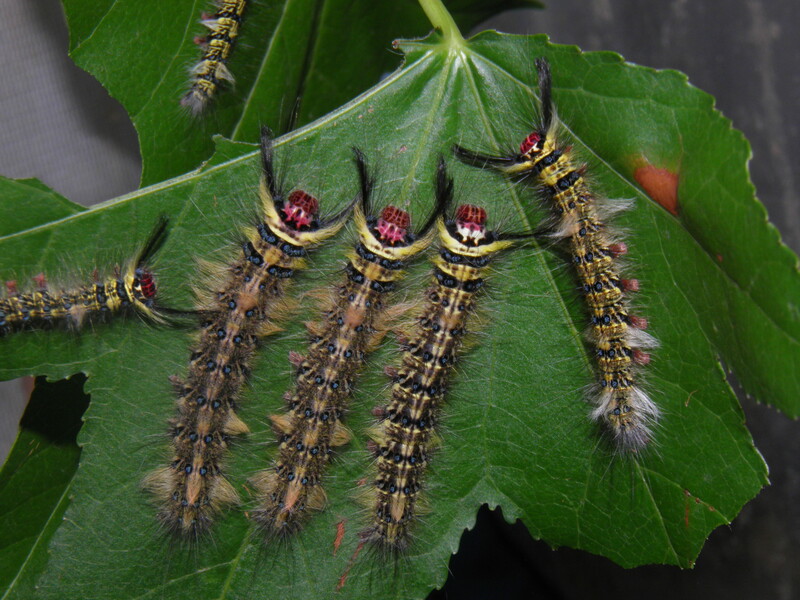 and are frequently reported on these plants, although the data may show a bias because these are commonly grown agricultural food crops, and humans tend to notice caterpillars more when they are found feeding on plants of economical important. The eggs of Trabala vishnou are laid in rows and are covered with the hairs of the females abdomen. They will either hatch in a few weeks time if it is one of the tropical subspecies, or potentially overwinter if it is one of the subspecies found in temperate regions. 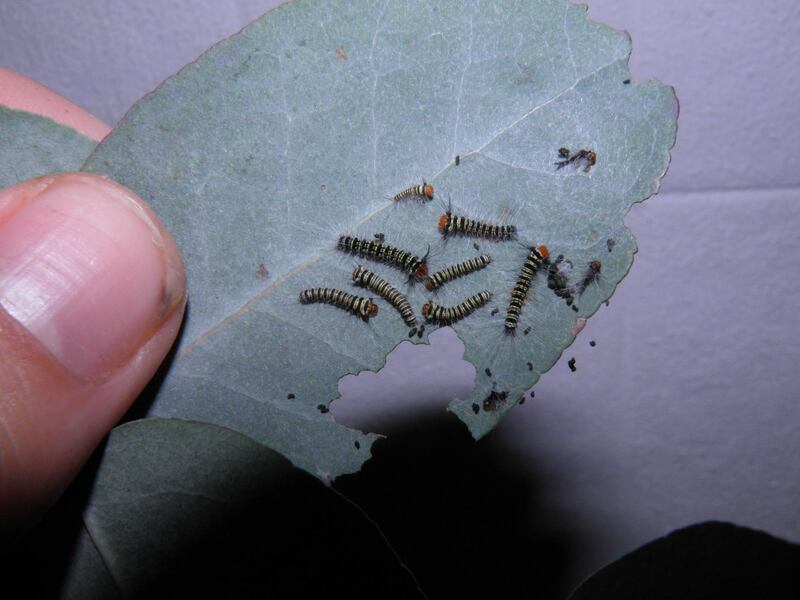 From these eggs, tiny striped caterpillars will hatch; their body is yellow or white with black stripes, grey tufts of hair and an orange/red head capsule. These tiny caterpillars will start feeding when they are about a day old or less and prefer to stay in eachothers general vincinity; they seem to be (semi) gregarious. 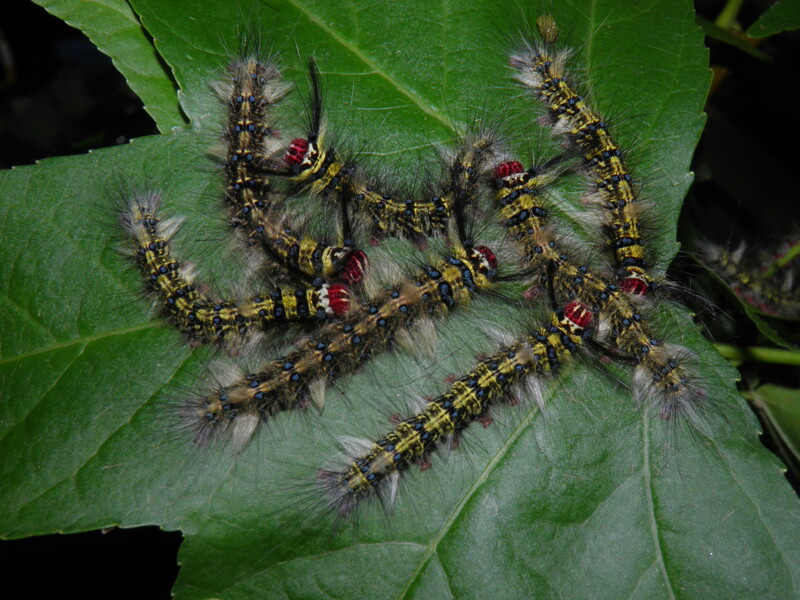 Often the caterpillars are found resting together on the same leaves. Generally speaking, Trabala vishnou are very easy to raise. Young larvae survive very well in closed plastic boxes, even with no ventilation, and consume a broad variety of vegetation. The older and more mature larvae however, desire a little more space and ventilation and are best raised in pop-up net cages or sleeves. However, this is not an absolute requirement since they seem to cope quite well with plastic boxes; just make sure to keep them clean and prevent condensation and mold in the containers. For the best result and minimal infection rates, ventilation is however recommended. 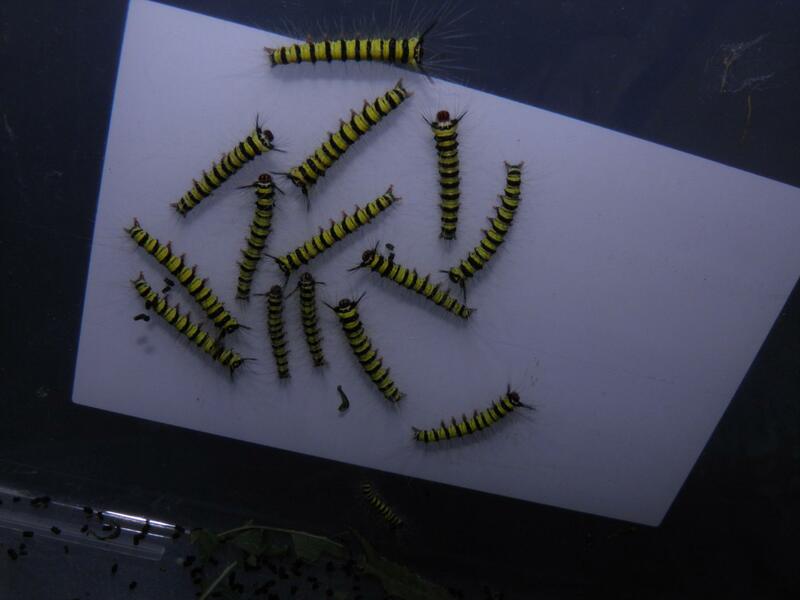 The larvae tolerate eachother quite well in high densities. 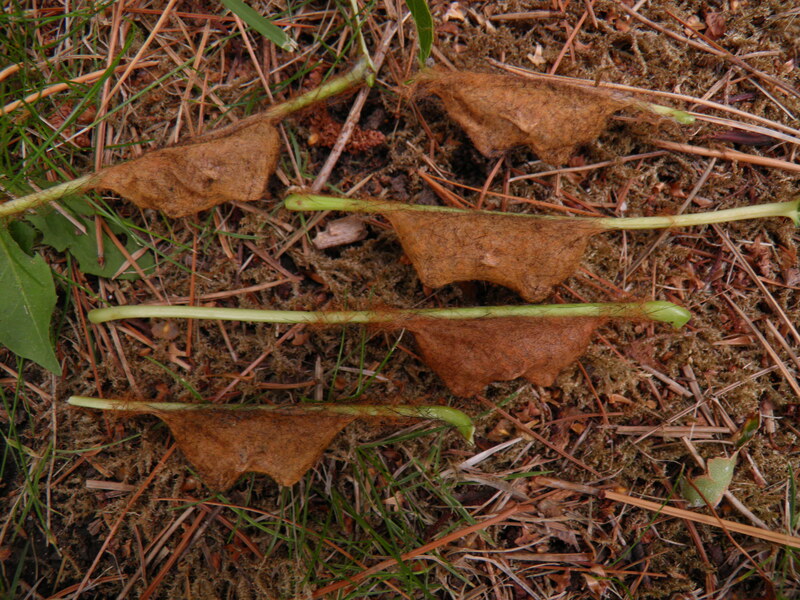 When they are ready to spin cocoons soon, the larvae turn orange; this is their pre-pupal camouflage. 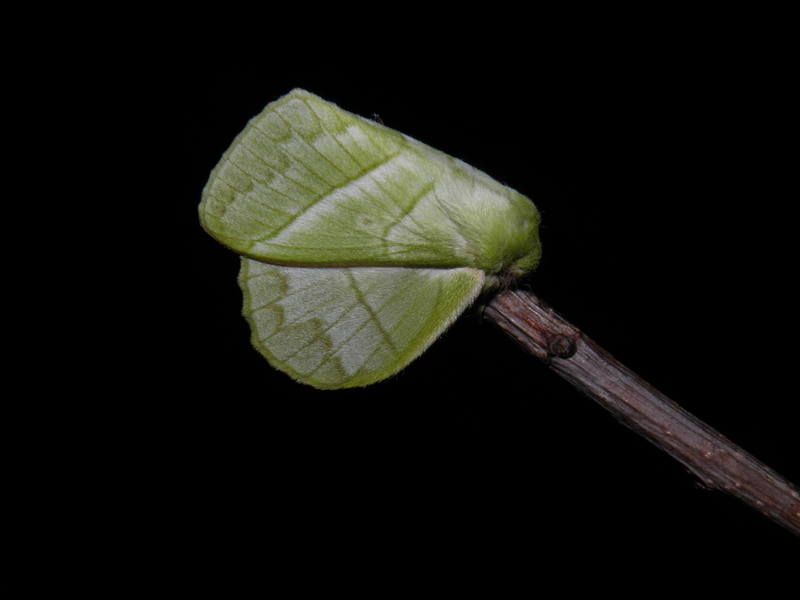 The larvae turn orange multiple days before the cocoon spinning begins. 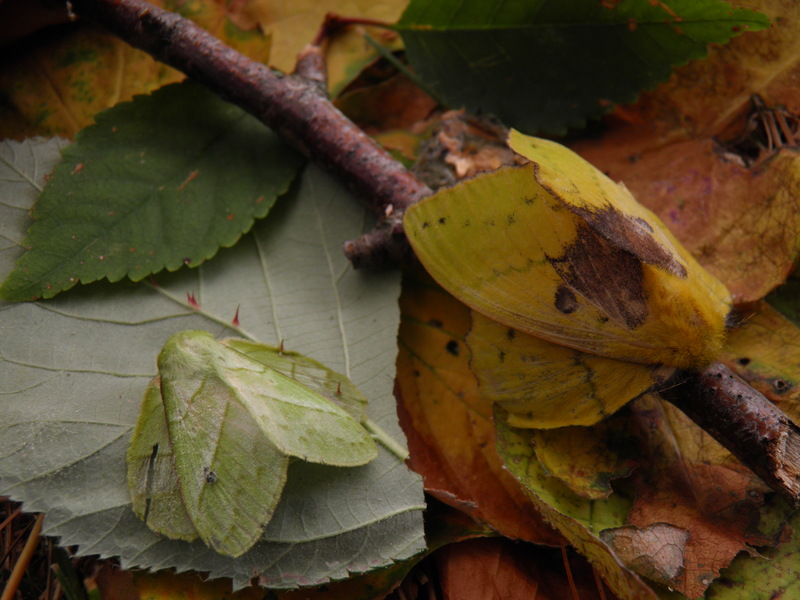 The exact differences in biology and distribution are unknown to me; although the larvae can look visually different and the moths have different habits in regards to overwintering. Contact me if you know the details. Trabala vishnou ssp. guttata (Matsumura, 1909) – ex Taiwan, that I have also raised in captivity. While I could detect no significant differences within the imagoes, the larvae were visually quite different – more hairy, pale, and white/silver.